In April I read a total of 4 books. I read some great books in April (courtesy of one of my dear friends who loans me fantastic books), which makes choosing a favorite one difficult. However, the one that I’ve been thinking about the most recently is Thornton Wilder’s The Bridge of San Luis Rey. Interestingly enough, I bought a copy of this book when I visited the Metropolitan Museum of Art in New York City last month without even realizing that Wilder, the mind behind Our Town, is the author. (Clearly, this was an impulse purchase if I’ve ever made one.) Its rather short length is certainly not indicative of the depth and resonance it possesses, making it a sort of TARDIS in a sense. (Doctor Who, anyone?) At any rate, if you have not yet read this book or Our Town by Thornton Wilder, I highly recommend them! In many ways, the month of April on a college campus feels like a whirlwind of contradictions. Apart from the aforementioned unpredictable weather, there are also lulls and spikes in coursework, feelings of excitement and exhaustion, and the desire to be in far more places doing far more things than humanly possible. It’s hard to balance doing coursework and focusing on wrapping things up for the semester in the midst of Easter and Spring Weekend festivities, yet that’s the sort of balancing act that April requires. 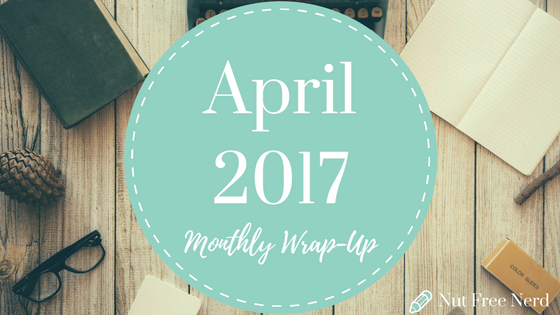 Overall, April was certainly a month to remember! I briefly want to mention the fact that I watched the original Star Wars for the first time this month, because I feel like that’s a pretty landmark event, at least for me. Up until this point I’ve been wading through life lost in a sea of Star Wars references I only vaguely understood, but now everything makes SO MUCH SENSE. And Yoda is so cute and funny! And I can relate to C-3PO so much! And Princess Leia is such a fantastic female heroine!! And THE MUSIC!! Finals week is now fast approaching, which means I am currently up to my ears in papers, papers, a few exams, and more papers. Though I desperately want the work to be done and over with, the prospect of leaving all of my friends behind when I move back home for the summer has painted everything with a bittersweet hue recently. I have two weeks left on this campus before embarking on the four-month stretch of summer (I know, we have a long summer break!). I’m really excited for the fun adventures that I’m hoping to have this summer, but in an ideal world those adventures would take place with my Wheaton friends alongside me. Needless to say, I’ve been feeling pretty conflicted lately! How was your month of April? What was the best book you read? Have you ever had a month where you read nothing? Did you do anything really fun or exciting? Let me know in the comments section below! Sounds like you had a pretty good reading month! I love that photo of you with the yellow camera, it’s so cute! And I’ve never seen the original Star Wars films either, so seeing someone else finally get to watching them reminded me that I still need to do that! Great post Holly! Great wrap up. My favorite book read this month has to be Elizabeth Strout’s Anything is Possible. I finished last night. I can totally relate to the always changing weather here in England, GOSH, it’s so annoying yet I love the beautiful sunny days 😀 I read 5 books this month… So I think that’s okay. DOCTOR WHO –> I’ve never compared a book to the Tardis before but it’s an interesting idea. I haven’t been keeping up with the new series so far, but maybe I will. I haven’t watched any of the Star Wars movies but I watched The Force Awakens and Rogue One for some reason? Good luck with all your work sounds stressful! GAH, thanks for mentioning my post in there! *sqeuals*. Checking out all the other links mentioned! My April was pretty decent, and I got a lot of things done! I think the best book I read this month was Divergent…which was VERY surprising because I thought I hated Dystopia. Last year, in the last few months of 2016, I was in A MASSIVE READING SLUMP, but 2017 kinda drew me out of it? I went to the science museum – so I guess that was exciting? For a geek like me 😀 And I ate lots of icecream – definitely a highlight. Omg the weather changes SOOOOO MUCH in Texas. Like a few days ago it was super hot, and then today it’s really cool and windy. LIKE WHY.